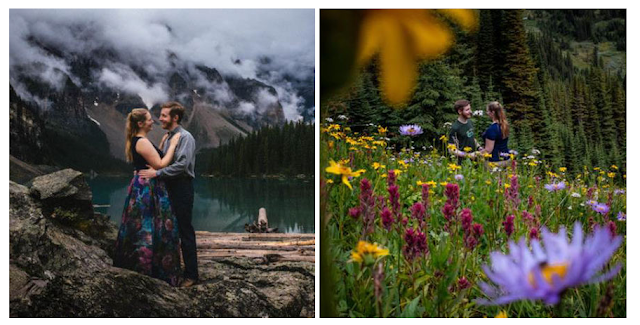 A newly engaged couple, Kelin Flanagan and Spencer Taubner hiked out to Banff National Park in Alberta last weekend in hopes taking some gorgeous engagement photos while outside. 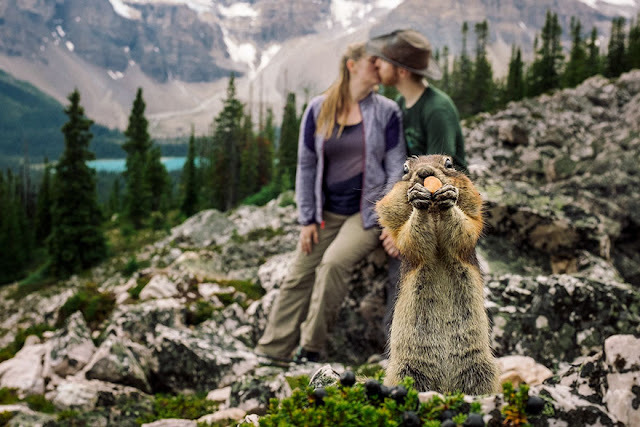 The outdoorsy couple thought that the Rocky Mountains would be an ideal location for the photoshoot since it had a beautiful scenery but little did they know that a little squirrel was going make their engagement photos one of the best photos ever taken. On the day of the photoshoot, the weather wasn’t in their favor so the couple didn’t get a chance to hike up to the Cirque Peak. Not being able to hike up to the Peak, the couple decided to turn around and just take a few shots on their way back down. BDFK photography told Huffington Post, “On our way back we saw a nice spot for the photos ― a kind of stony area. When we started shooting, the squirrel showed up. ” And showed up he did. The squirrel made sure he was photographed. 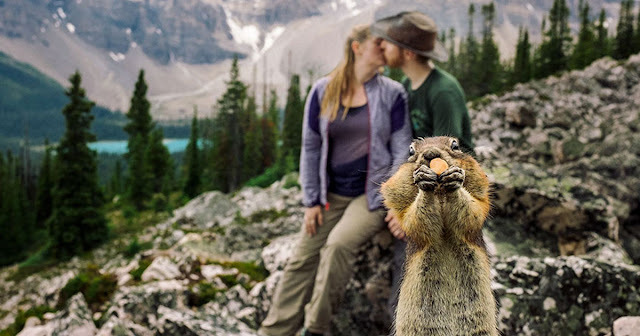 Mouth full of nuts, hands to his mouth munching, this squirrel photobombs the couple’s engagement photoshoot at the perfect timing. Unaware of the romantic proceedings going on behind him, the squirrel was photographed along with the couple kissing while holding a nut to his mouth. The squirrel ended up being the climatic point of their whole photoshoot. A hilarious amusement for the couple’s family and friends.